The Dutch International Zouk Congress takes place at the Studio76 Event Center in Breda (Etten-Leur). You can see at the website of NS Highspeed for special international trains. When you book in advance the tickets for the international train are very cheap. 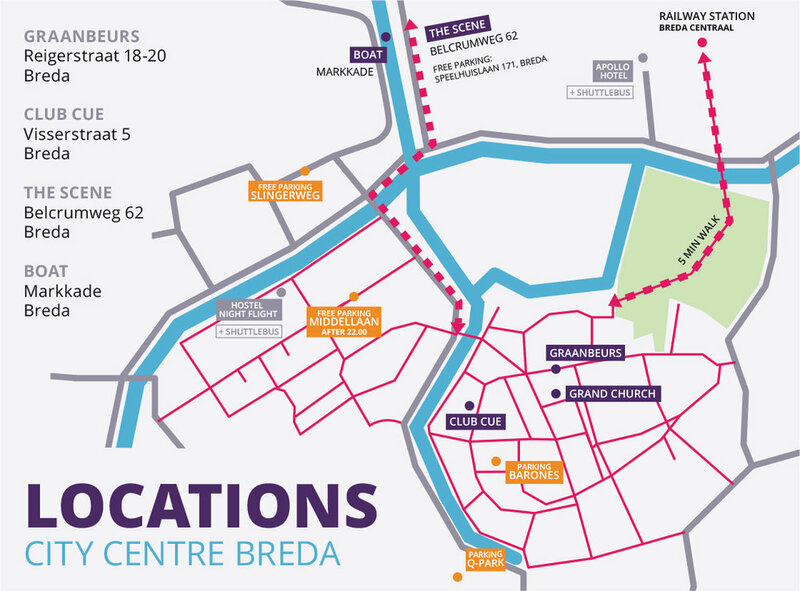 There is a fast train INTERCITY DIRECT going from the airport to Breda. The trip takes about 50 minutes. You need to buy a supplement for this train! So you have 2 tickets. You can buy these tickets in the main hall at Schiphol at the Nederlandse Spoorwegen desk. The train makes 1 stop in Rotterdam and the last stop is Breda. Check the website for the timetables www.9292.nl. There is is a bus from airport Rotterdam taking you to Rotterdam Central Station. You can buy the busticket in the bus. From the trainstation you take INTERCITY DIRECT to Breda, which is the next stop of the train. The trip takes about 10 minutes. You can buy traintickets at the desk in the main hall at the railway station. Check the website for the timetables www.9292.nl. There is is a bus from airport Eindhoven taking you to Eindhoven Central Station. You can buy the busticket in the bus. From the trainstation you take the INTERCITY TO THE HAGUE. The train stops in Tilburg and the second stop is Breda. The trip takes about 30 minutes. You can buy traintickets at the desk in the main hall at the railway station. Check the website for the timetables www.9292.nl.